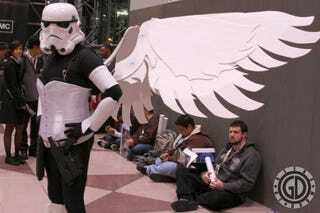 Winged Stormtrooper via Geeks of Doom. To return to the original post click here. At first we thought this was Peter Jackson's Sumatran rat-monkey, but he doesn't have the same eyes. Hmmm. Commenter MinusTheSnake has identified this creature as Killer Croc from the Batman: Arkham Asylum/City game series. Thank you.